Providing you the best range of new generation multi micronutrient fertilizer, calciam amino acid chelate, potassium salt of natural amino acid and protein mineral complex with effective & timely delivery. NEW GENERATION MULTI MICRONUTRIENT FERTILIZER. exceedis thecomplete Amino Acids based Micronutrient Fertilizer Mixture. exceedcontains almost all Micronutrients in a balanced proportion. exceedcontains Zinc, Iron, Manganese, Copper, Boron, Molybdenum, Magnesium and Organic Nitrogen. exceed provides organic nitrogen along with micronutrients in chelated form, helps quick & easy absorption by the crop. exceed plays an active role in respiratory function. exceed helps to overcome stress conditions. exceed helps to boost up energy metabolism in the plant. exceedprovides readymade& easily assimilablesource of nutrition. exceed helps in pollination and fruit formation. exceed helps to activate Phytohormones & other growth substances in the crop. exceed increases chlorophyll concentration & boosts the photosynthetic activity. 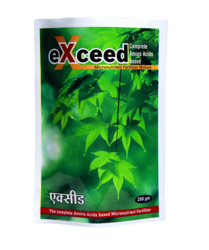 exceed is useful to maximisegrowth & yield of crops by correcting micronutrient deficiencies like cotton, sugarcane, cereals, pulses, vegetables, fruit crops, floriculture etc. Foliar Spray :- Dissolve 250gm of exceed in 200 Liter of clean water & spray on the foliage. This is sufficient for one acre. Number of Sprays: - Two sprays are recommended at peak growth stages. Compatibility: -exceed is compatible with most insecticides &fungicides, except those with alkaline reaction. Packing: - 100gm,250gm, 500gm,1 Kg. 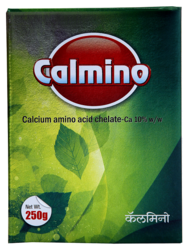 Calcium as Ca 10 % with amino acid as natural chelating agent and is capable of self-mobile element wherever it is required for cell metabolism, in meristematic tissue zone for generation of new shoots & developing fruits. Calmino gives structural support to cell wall results in crispy, glittering fruit skin. Strengthened cell walls make fruit more crispy and also impart longer shelf life for all vegetables & fruits.Calmino regulates the uptake of nutrients through root system.Calmino helps in root & pollen development.Calmino plays important role in transport of sugar & amino Acid building metabolites. Calmino application overall results in added nutritive value for human health.Calmino enhances longer shelf life & market appreciation. Foliar Spray :- Spray Calmino @ 0.5 gm to 1.0 gm per Liter of water during peak vegetative growth phase after every week up to maturity of fruit & suitable for all fruit & vegetable crops. Compatibility :-We recommend Calmino spray along with Boron for better effect,preferably not to be used along with other Agro chemicals and Phosphatic fertilizers. K as K2O – 18% Min. K- mino is designed for foliar feeding on plants to prevent or correct Potassium deficiencies that may limit crop growth and yields. K-mino is water soluble and non toxic to plants when applied as directed. Grapes & other fruit trees like bananas & vegetables have a high Potassium requirement, for best results, apply K- mino according to recommendations based on plant tissue for analysis. K- mino enhances translocation of sugar and starch formation. K- mino is also required for opening and closing of leaf stomata. K- mino strengthens plants and improves plant resistance to drought and diseases. K- mino improves stress tolerance. K-mino improves quality, color, taste, yield, and shelf life ofthe produce. K- mino helps to correct Potassium (K) deficiency of plants. Foliar Spray :-	2 to 2.5 ml perliter of water. Soil Application /Fertigation :-	1 to 2 Liter per acre. Compatibility :-K-mino is compatible with almost all kinds of fertilizers except Iron & Copper Sulfate . 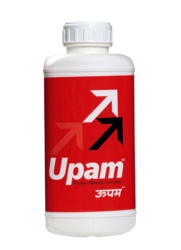 Upam is Mineral amino acid chelate resulting from a reaction of various soluble mineral salts with amino acids of natural origin with a mole ratio of one mole of metal ion to one to two moles of amino acids to form coordinate covalent bonds i.e. to form a true chelate. Upamis formulated as per grade notified by concerned State Govt. and is available in soluble liquid form. Upamdelivers micronutrients with maximum bioavailability,tolerability & safely as it is specially formulated as the state of the art technology. Upamplays an important role in physiological, biochemical process of the plants as it contains micronutrients in chelated form. Upamis a high performance 100% water soluble liquid for foliar spray. Foliar Spray Dissolve 2.5 ml per liter of water. Compatibility :Upam is compatible with most insecticides& Fungicides, except those with alkaline reaction. Looking for AMINO ACID CHELATES ?